Dallas-Fort Worth Brain Tumor Walk will fall on the 21 month anniversary of Lindy’s death. I regretfully announce that I will not be walking this year. Last year was a phenomenal year. I want to remember Lindy going out on top with her efforts. She was very dedicated for 5 years and was the number one fundraiser every year. With $30k+ being raised in the year of her passing, I know Lindy was proud and honored by her friends last year. I have set up the Team Lindy Lou page and would be honored if you did donate this year. It is a great cause and they are making huge strides in the way they are researching a cure that will be the benchmark of the way other diseases will eventually research their cures. However, it’s for personal reasons that I don’t want to do the walk this year. In a short explanation, Lindy wanted me to move on with my life. I honor her in so many other ways that aren’t a reminder of how she died. I am choosing to remember her other qualities. Yes, her courage and strength are what will get me through my challenges with my disease, but her numerous other qualities go beyond how she faced her eventual demise. The past 19 months have been an incredible journey. Both incredibly hard and incredibly trying, sad, depressing, joyous and painful, all at the same time. I wouldn’t trade those seminal, personal experiences for anything, except the chance to have Lindy back. The moments I have had these past 19 months have made me feel closer to her than I have ever felt. I cherish them and always will. My travels, with her in spirit, to Spain and Paris twice to walk the several hundred miles on the Camino de Compostela, unknowingly completing her Walk for Jacque, were indispensable to my mental health. Not knowing until the end of the Camino that the route I took was also the name of Lindy’s original tumor (and also the one that ultimately robbed us of our future) was nothing short of a divine sign that God was bigger than our circumstance and was and is always in control. (Tears flood as I type this knowing this was the first thing I did shortly after her burial. What a surreal moment for me). I have also climbed the majestic, uber-challenging Mt Kilimanjaro alone to commemorate the first anniversary or her passing, and to mark my extremely hard, personal mountain to regain any sort of normalcy from losing my life, my love, my heart, my everything. Her not physically being around to share our lives together anymore brings me the most heartbreak. My journeys with her in spirit also pays tributes to her love of travel. I have and am successfully honoring my wife’s memory by living outside myself. I will always continue to do this. I don’t think there is anyway to top last years walk for the brain tumor society, nor do I have it in me to be the prodder for another drive. I learned today that my latest MRI shows several new lesions on my brain. My MS is progressing and I know Lindy would want me to focus on that. I have put my complete faith in Jesus and that journey, in and of itself, has been incredible, both in great ways and difficult ones. I have experienced personal miracles, breakthroughs and growth that can only be attributed to Him. I face the distressing journey of rebuilding a life, and I will do this with His help. In him, I truly have the joy that I will one day reconnect with her. I don’t know what that will look like, but that’s not the important thing. The important thing is that I do all I can to make sure I do get to join her. Please donate to this cause. Lindy put so much effort in helping them get closer to a cure and advance treatment options. She was a recipient of several therapies that they championed. They allowed her to live beyond medical expectations . She truly helped because she believed they would find more breakthroughs that could save her life. She believed in them and now other believe in them. These newly diagnosed people are hoping for a cure. What the National Brain Tumor Society is doing is truly unprecedented in cancer research. It’s the most advanced research to date. Their goal is to double life expectancy for Glioblastoma patients within 5 years. This is the same tumor type that Lindy had. She was given 12 months and lived almost four productive years. The hope is that someone else will benefit from their research. Someones little person, wife, brother, mother, friend, or loved one. 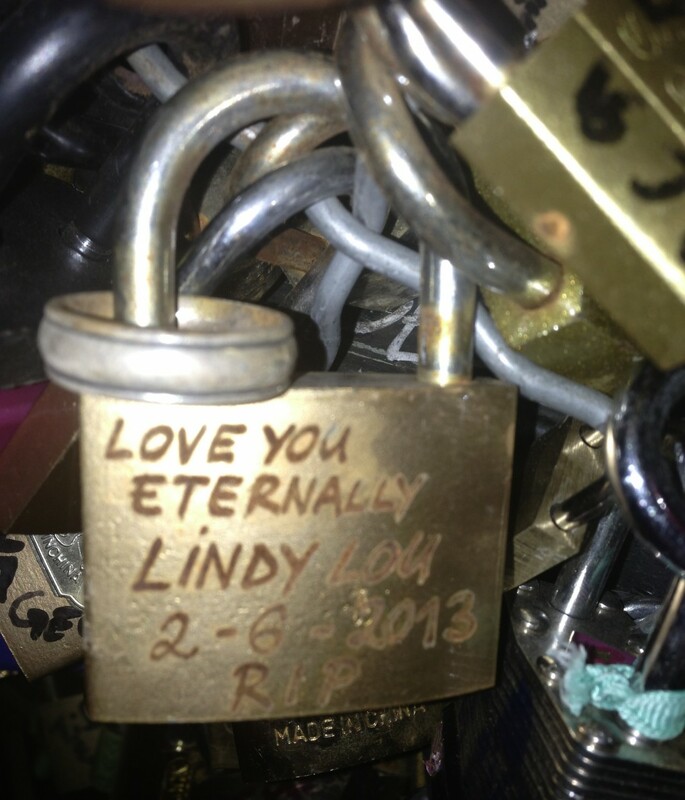 In memory of our Lindy Lou, please give. Thank you. I will be donating 100% of the proceeds from the sale of the CD that I recorded in memory of Lindy. (Just so you know, If you haven’t purchased the CD, it isn’t depressing. Sure there’s a couple of songs that are, but in large part it is upbeat)! Posted on September 9, 2014 September 12, 2014 by michaelpaulcox	Bookmark the permalink.